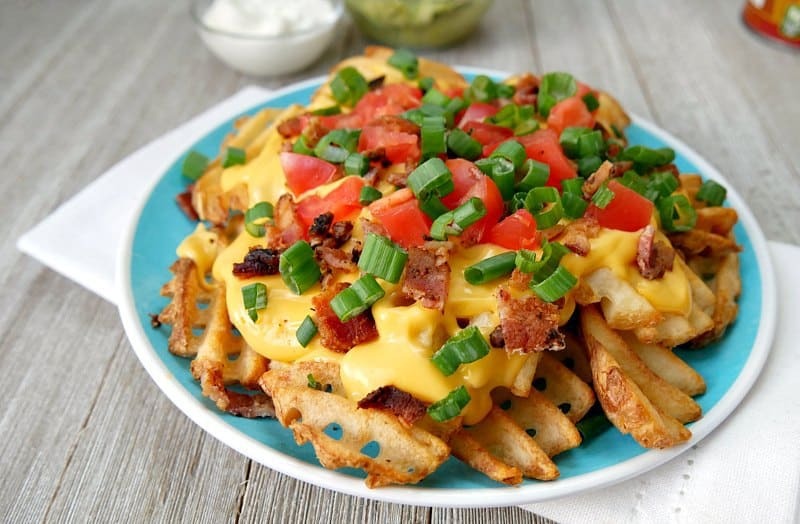 Whip up this Irish nachos recipe with a bag of frozen waffle fries and Ricos Nacho Cheese. Top with bacon, green onions and tomatoes. 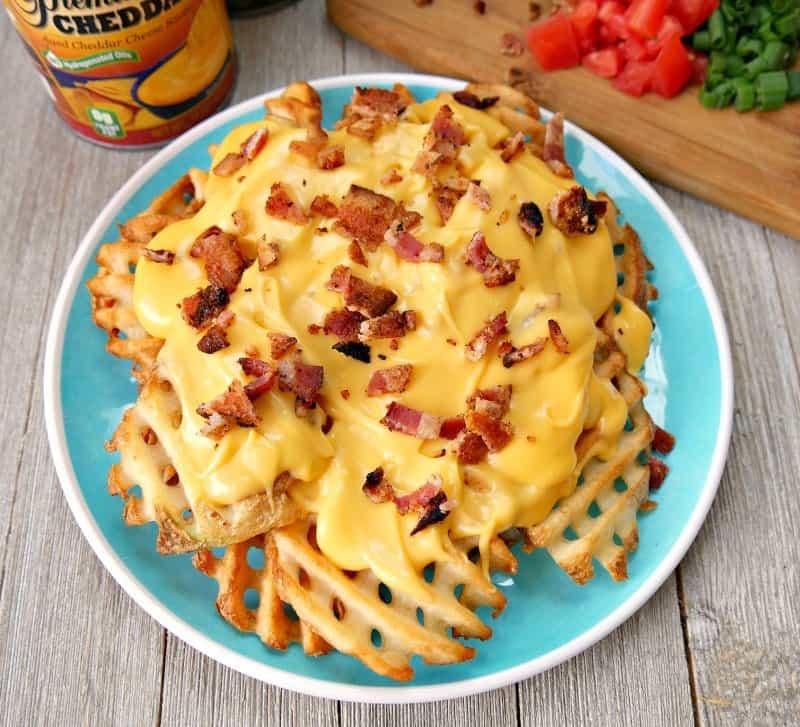 Plus a secret to getting perfectly crisp waffle fries! This post is sponsored by Ricos Cheese. Oh, nachos. How we love thee! There is nothing quite like a huge pile of chips topped with golden, delicious nacho cheese. Add a bit of tomatoes and onion and it's pure deliciousness. Is there anything better? Well, yes, there is. I was in a restaurant a few years ago and they has Irish Nachos on the menu. I love Irish food but I'd never heard of IRISH nachos. Turns out that the dish is basically nachos, but instead of chips, you use potatoes and then top with your favorite nacho toppings. While these delicious nachos aren't an authentic IRISH recipe, but they are still fun for dinner, a party or even St. Patrick's Day. Most Irish nacho recipes I've seen call for freshly made potato slices that are then pan fried. We don't have time for that. I wanted a quick and easy recipe. 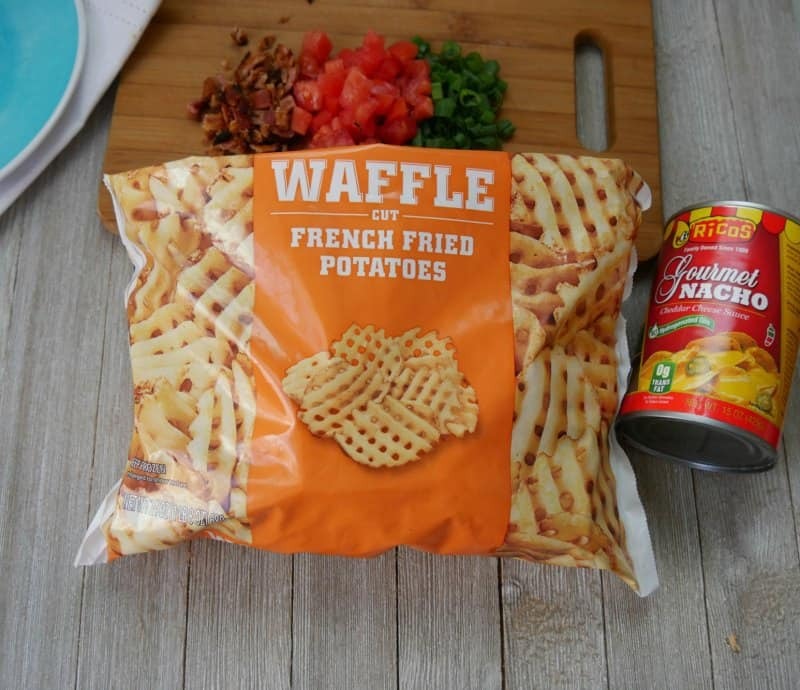 Frozen waffle fries are perfect for Irish nachos. They are large and round and hold the toppings well. Plus, who doesn't love waffle fries? 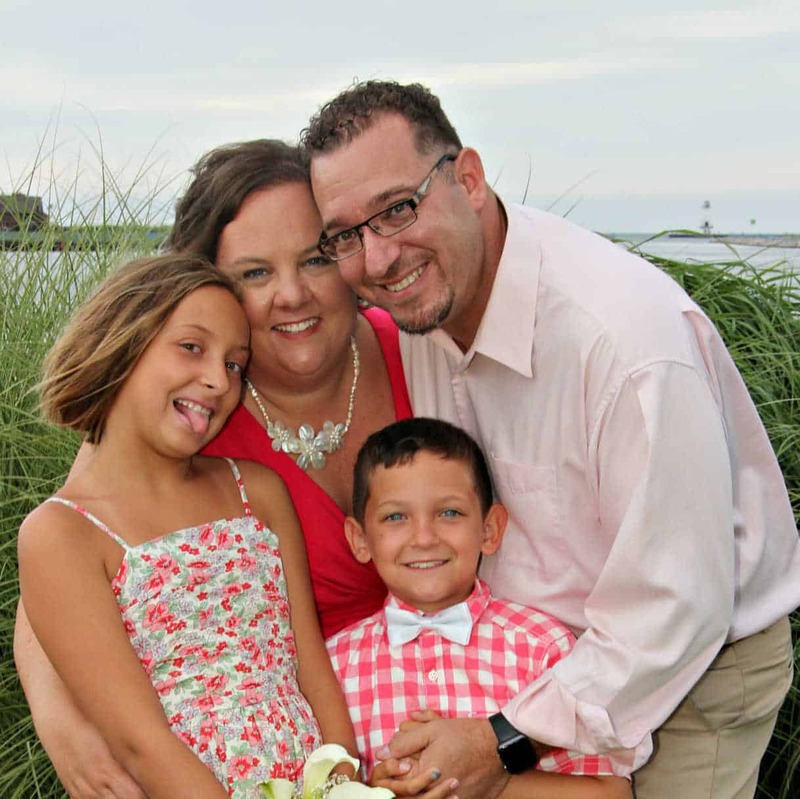 They make everything better. You will also need cheese. These are nachos after all. 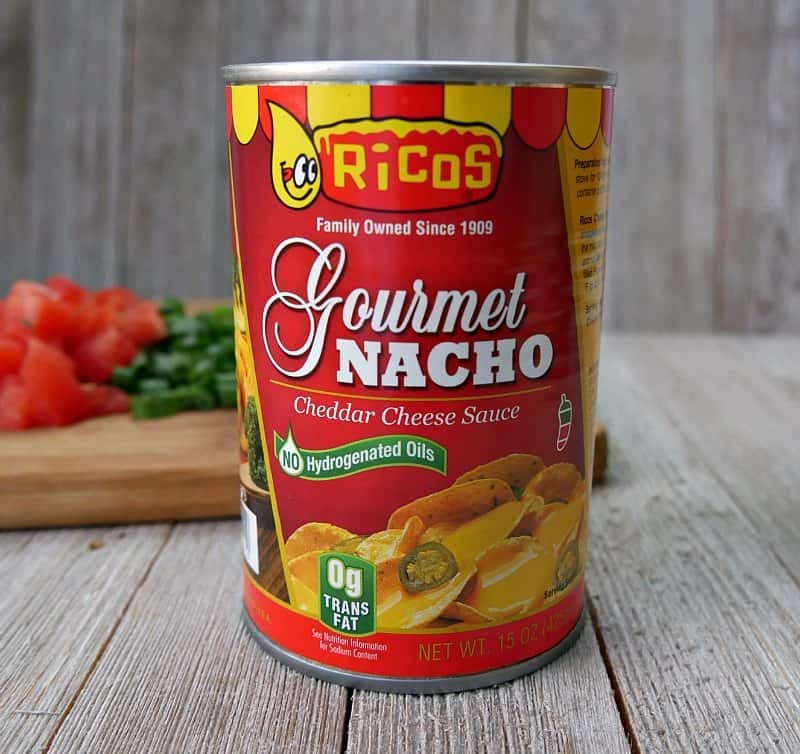 I skipped the shredded cheese and went right to the real stuff – Ricos Nacho Cheese. I picked up a few cans at Walmart. And until May 31, 2018, you can enter to WIN FREE Ricos! 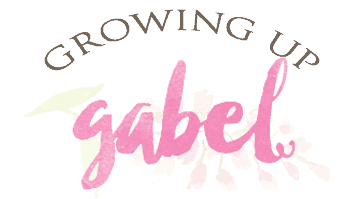 Just go here to get more information and enter to win! 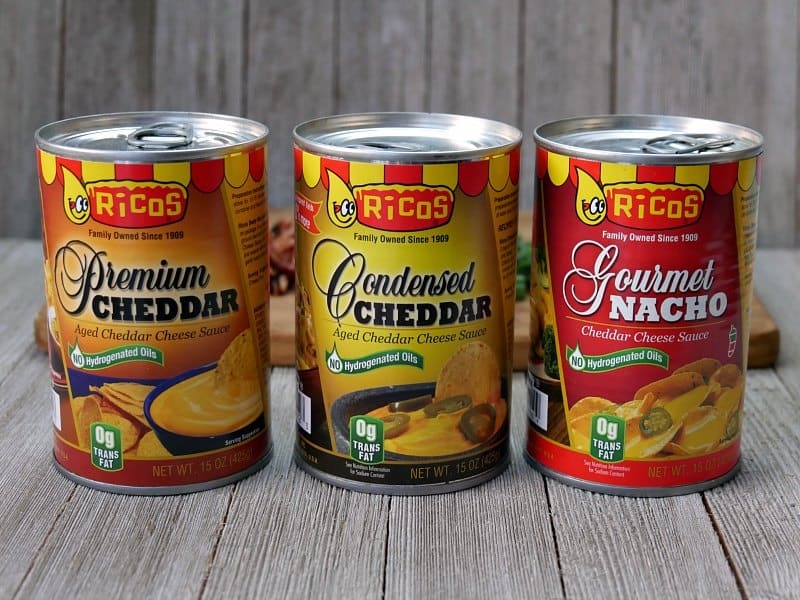 If you prefer, Ricos offers other varieties of cheese including different options for cheddar and even a white queso. You can totally serve the nachos with just the Ricos cheese. But if you love a fully loaded baked potato, you'll love loading up these nachos. Crispy bacon pieces, diced tomatoes, and green onions are great toppings and add jalapenos for a little extra heat. Making Irish Nachos is super easy. 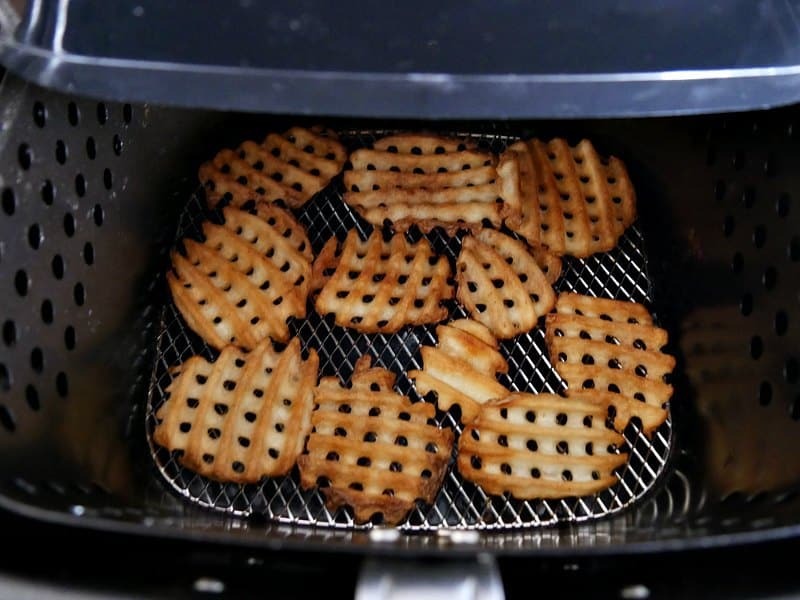 Start by cooking the frozen waffle fries. You can bake them in the oven according to the package instructions. But we love to cook “fried” food in our air fryer. All the crispiness of a fried French fry but without the oil. We cooked the first batch on 400 degrees for 15 minutes and they got a little toasty. The next batch I did for 10 minutes and they were perfect. If you don't have an air fryer bake in the oven. 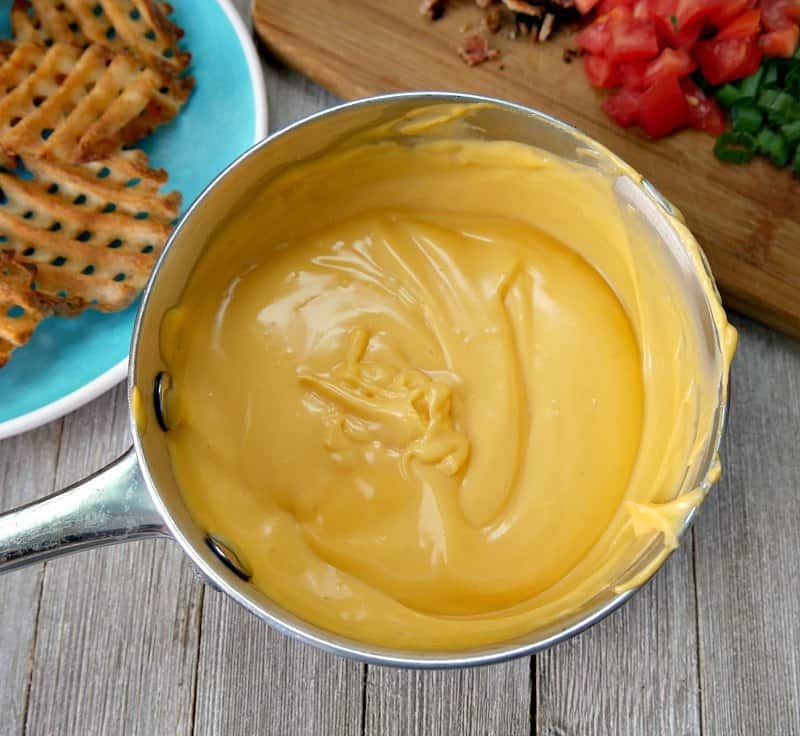 While the fries are cooking, warm the Ricos Nacho Cheese on the stove top or in the microwave as directed on the can. The cheese needs to be warmed up to make it smoother and easier to spread. Once the fries are cooked and the cheese is warmed, it's time to make the nachos! Pile the waffle fries on a plate or platter. 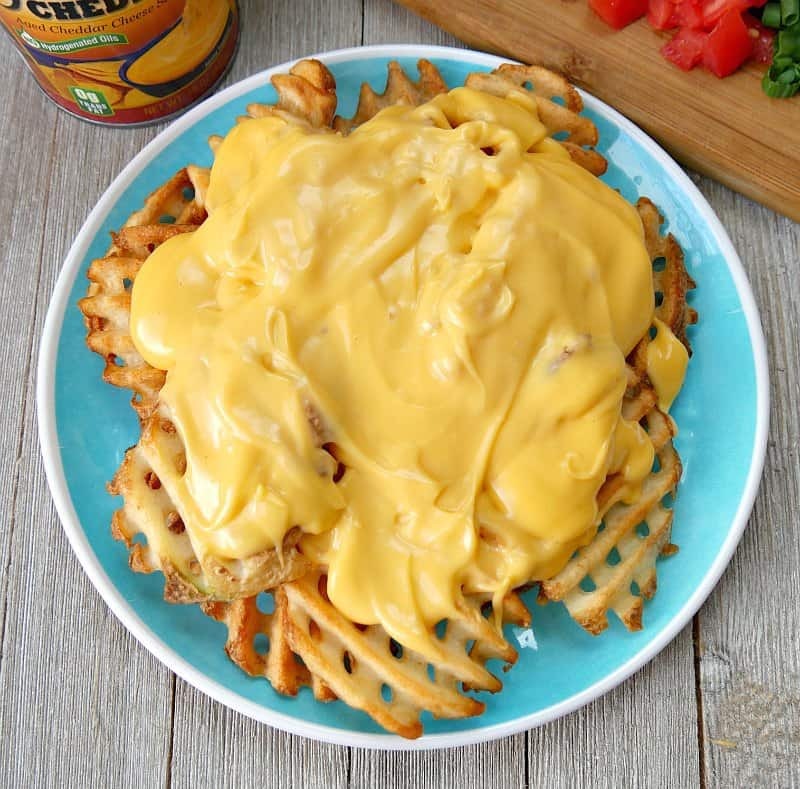 Next use a spoon to spread the cheese on top of the fries. Smother might be a better word. Get them nice and cheesy! Finally, add your favorite toppings. Bacon is an absolute must! We also added diced tomatoes and sliced green onions. Jalapeno rings would also be great for a little kick of heat. Serve the Irish nachos with sides of guacamole and sour cream for dipping. Serve them hot and fresh! Prep nacho toppings by cooking and dicing as needed. Cook the waffle fries according to package directions. 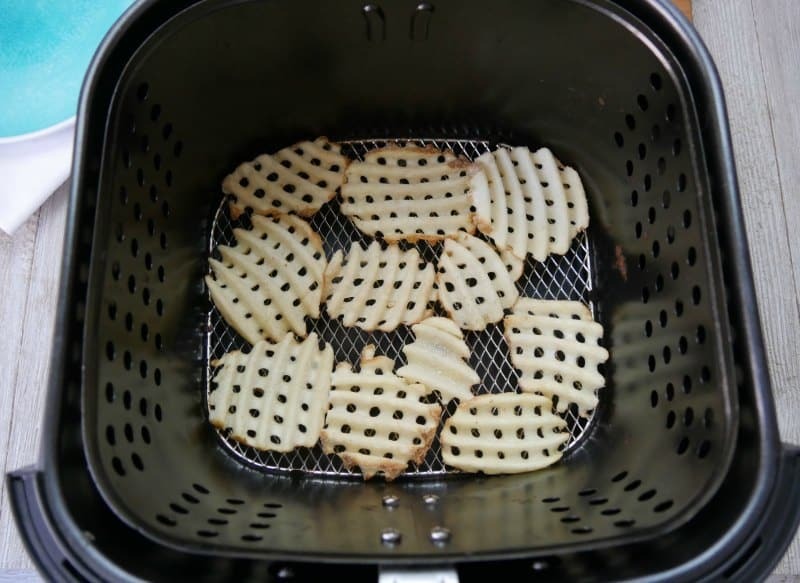 To cook in an air fryer, place frozen fries in a single layer in fryer. Cook on 400 degrees for about 10 minutes. You may need to toss them half way through. 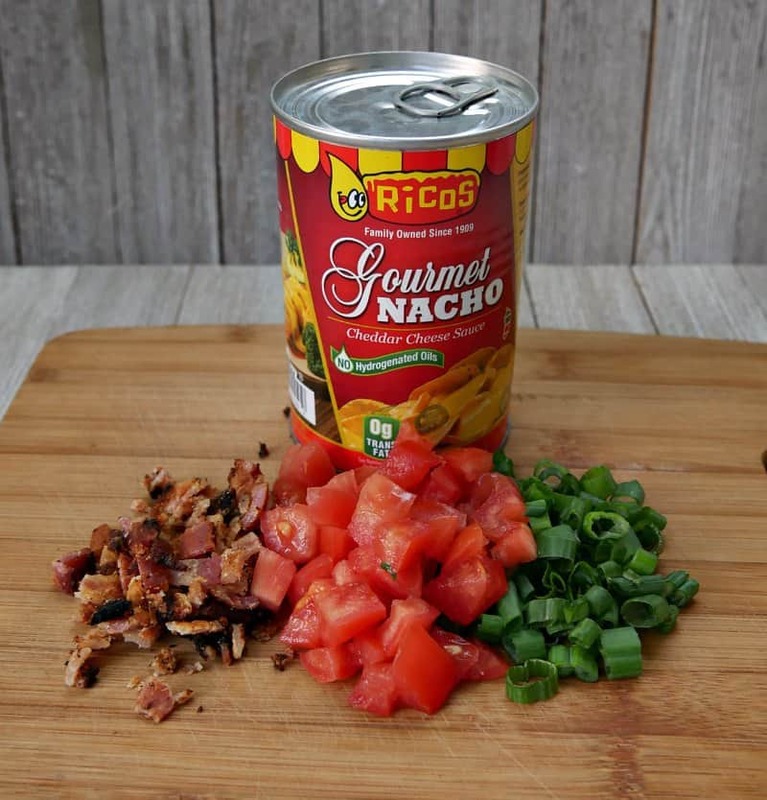 While fries are cooking, warm the Ricos cheese according to directions on the can. Pile cooked fries on to a serving plate or platter. Top with cheese and toppings. These look amazing! I’ve never tried or heard of Irish Nachos before, but I am willing to bet they are going to be a big hit at my house! Oh yum! 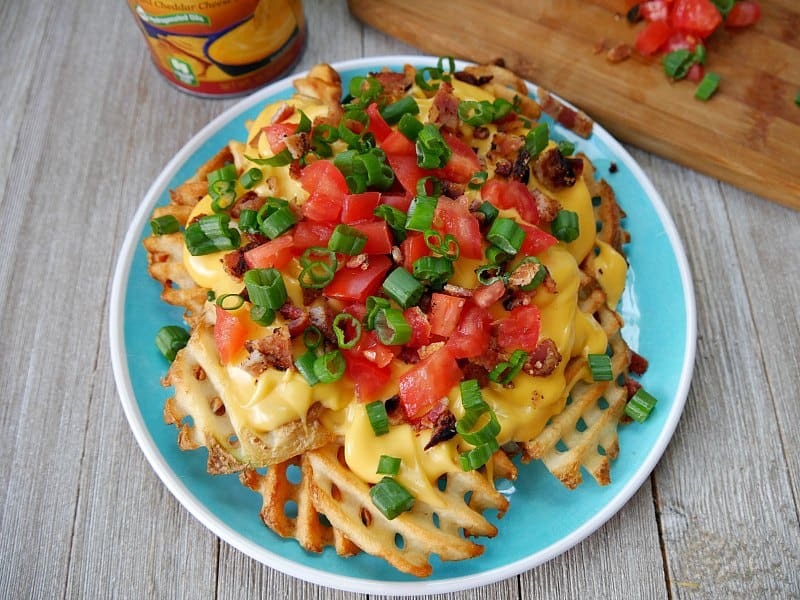 I love waffle fries and this looks so good! Oh my word. I need an air fryer! 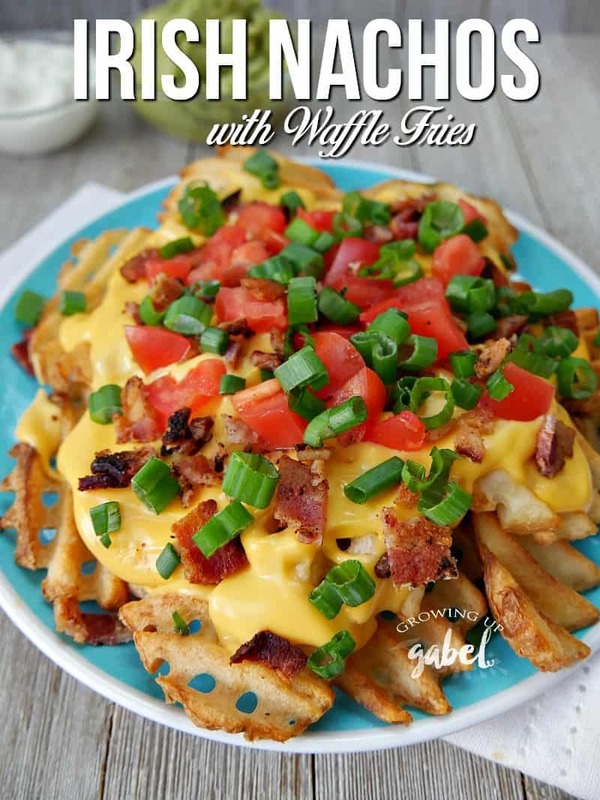 And I need to make these waffle fries! They look delicious with all that yummy sauce! Oh my! 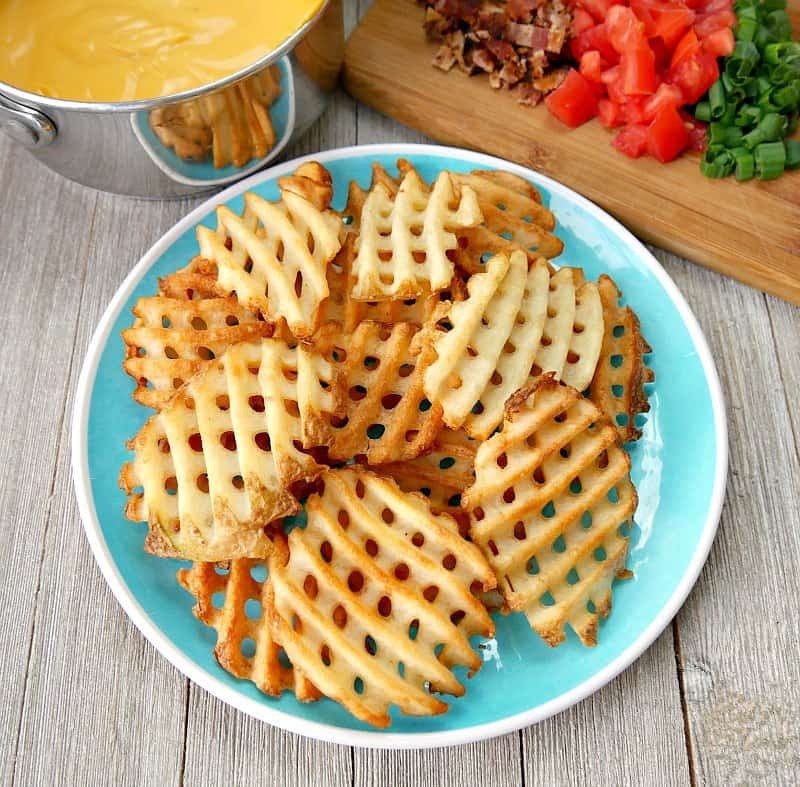 These Irish Waffle Fries are on my “to make” list! Yum!